One of the cool things about BBQ is the unique locations and settings in which great "Q" can be found. In my travels, I have yet to find a cooler place for "Q" than Rockstore Bar-B-Q just outside Charlotte, NC. The small stone structure was originally erected as the first and only gas station in the area in 1936. 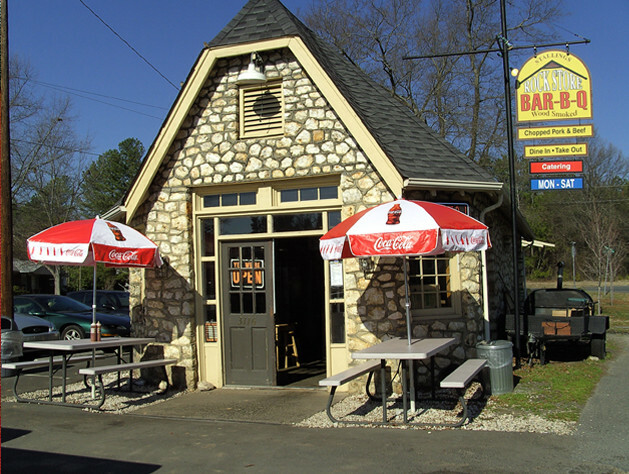 It later became a convenience store until two Stallings natives purchased the building and converted it to a Southern BBQ joint. Today, Rockstore Bar-B-Q serves authentic smoked favorites like pulled pork, brisket, pulled chicken and the house specialty, baby back ribs. The menu is small and simple. Customers have the choice of getting their pork, chicken or brisket on a sandwich or a plate with homemade sides. Ribs can be purchased in half racks, full racks or as a half rack plate (including two sides and a drink). Though, I'd already spent the better part of the day in Lexington, NC at the Barbecue Festival, I jumped at the chance to check out Rockstore Bar-B-Q when a close friend, whom I was visiting, suggested it Saturday evening. We arrived around 7 p.m. shortly before closing. There were just handful of lingering patrons finishing up their dinners and picking up orders to take home. When I visit a joint for the first time, I try to get a sampling of as many different meats as possible, but Rockstore Bar-B-Q doesn't offer any type of combination platter. After speaking with the attendant at the counter, he suggested that the ribs were Rockstore's signature item. I didn't need a lot of convincing. Ribs are always my first choice anyway. I ordered the rib dinner (half rack w/ 2 sides - beans & slaw). Knowing that I would undoubtedly have to share with Katie when I returned home, I picked up another 1/2 rack just to be safe. The ribs come with or without sauce. I ordered mine with Rockstore's Western style (ketchup based) sauce on the side. The ribs definitely passed the two initial tests, smell and sight. They filled the car with an intoxicating smokey aroma as we drove home. Thankfully it was a short drive. The baby backs were meaty and had a beautiful pink smoke ring. Getting the sauce on the side really allows you to get a better sense of the actual flavor of the rib. Rockstore Bar-B-Q's ribs are lightly seasoned. 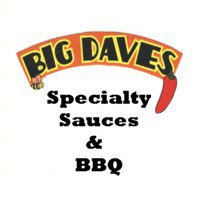 They rely heavily on the hardwood smoke flavor and the natural deliciousness of the pork. While most ribs come slathered in a sticky sauce, Rockstore's baby backs were a refreshing change of pace. The ribs were moist and very tender. I was able to pull the bones apart pretty easily. However, the meat was still firm enough to cling to the bones as they were pulled apart (like it should). It's rare to find smoked pork ribs so perfectly cooked in a restaurant. The smokey, lightly seasoned ribs were excellent on their own, but I wanted to test out their sauce as well. Rockstore Bar-B-Q's Western style (one of four varieties) sauce is thin and tangy with a hint of spice in the finish. It's not the style of sauce that I would typically use for ribs, but I was very impressed with how well it complimented the pork. Drizzling the sauce over half the rack worked well. It also made a fine dip. The beans and slaw were suitable side dishes. Both were above average in quality if slightly below in quantity. They were, however, an afterthought as I devoured the ribs. Sure enough, I ended up having to share a pretty good portion of them with Katie. They got a strong "thumbs up" from her as well. Rockstore Bar-B-Q turned out to be as tasty as it is unique. The small rock building is definitely the coolest looking joint that I've come across and the ribs were the best that I've had this year (2011). If I had a complaint it would be the inability to order different meats in combination for one price. However, the ribs were good enough that I probably won't get around to ordering anything else anyway. Click the title of this review to see Rockstore Bar-B-Q's website. See how their ribs compare to other joints from across the country on the "BBQ Ratings" page. 1 Response to "Rockstore Bar-B-Q (Stallings, NC)"